being MVP: Bedtime Made Easier with My Tot Clock & One for You! Bedtime Made Easier with My Tot Clock & One for You! By now I'm sure you all know of my frustration with Kenzie's sleeping habits. I need to get her into her own bed for the entire night before Bean #2 comes because (according to my brother) she will resent me if she gets kicked out the moment he arrives. 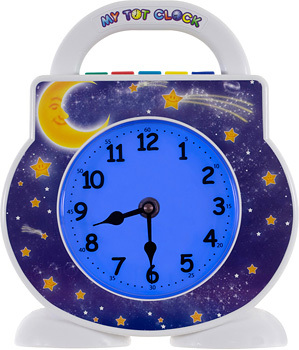 My Tot Clock is a fun sleep-aid, alarm clock, nightlight and timer all-in one! The setup is pretty simple in that you just need to set your current time on both the analog and digital clocks, set bedtime/naptime with your sound options (I did the lullabies), set wake time, set encouragement time, and set discipline time. I didn't set the last two and just started off with the sleeping training. My Tot Clock uses 4 AA batteries (not included) or the included AC plug. I decided to go with the batteries because Kenzie wanted to carry around her clock. Let's just say I won't be keeping up with the batteries due to expense. Kenzie likes the music and the story voice is very soothing. I also like that the face of the clock changes colors according to the "time" to allow Kenzie to associate bedtime, naptime, wake time. The standard included facebook features a nightime motif with stars and the moon. One can purchase additional decorative faceplates to fit their child's personality. There are also several different Tot Clock Treasures i.e. stories and lullabies that one can purchase to give variety to the standard routine. My Tot Clock comes standard with "Welcome to Children's Dreamland". My Tot Clock is placed at the foot of Kenzie's bed so she can hear and see the clock but it's not directly in her face. The other day was actually successful in the bedtime routine but she woke up around 12:30 p.m. and back to my arms..sigh. I am going to keep trying somewhat diligently to get her into a routine where she sleeps soundly in her bed and I get to get a semi good night's rest! Make sure to connect with My Tot Clock's Fan Club on Facebook! One Winner will Receive a My Tot Clock (ARV $49.95)! i love that it changes colors to different times through the day!!! My favorite feature is the Built in discipline timer! I like that it plays bedtime stories, lullabies, fun wake music, and even white noise! I love that this lights up for easy learning! I love the different color display for different representation of situations. A great learning tool. Patricia. I like that it changes color. My favorite feature is the Built-in Discipline Timer (red light) when a little timeout is needed. I like the time out timer. I love the nightlight feature! I love that it has a seperate light for when it's ok to get up! I like that it has hangeable faceplates to match your child’s interests or bedroom theme. I love all the sounds it makes, even white noise! I like that non-readers are still able to tell when they are 'allowed' to get up...not at the crack of dawn! I love the Discipline Timer! The discipline timer. super handy! I like how it changes color when it's time to wake up. Forgot to add this on my last post concerning my GFC name. to match your child’s interests or bedroom theme! love the is changes lights and has the night light awsome! Cindy B (on rc/fb) ~ I love that it plays bedtime stories. Thanks for another great giveaway. I think that the Built-in Discipline Timer (red light)when a little timeout is needed would be a great tool! I love that you can change the color of it for the different needs! I like that it also has a nightlight. It makes a great night light with 5 levels of illumination. I love that it changes colros to let them know its ok to wake! !